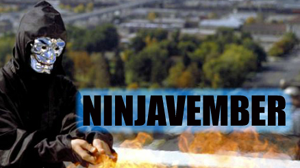 Ninjavember is an annual blogathon event sponsored by Fist of B-List and dedicated to the best and baddest and worst in ninja film. See below for all coverage from past years. We graciously thank all of the blogs that have participated over the years, as well as the many readers who came through for a dose of masked mystique. Really great idea! It was fun to participate in and to read others' reviews. Lookin' forward to next year!